The Easter Sunday of 2015 is coming soon, and the spring is also arriving soon. On that day, the whole family will get together and enjoy a marvelous dinner. If the weather is good, maybe the families and friends will go outside for a picnic, that’ll be also sweet and unforgettable. If it isn’t a pleasant day outside, people may choose to chat and play games at home. The traditional Easter Egg Hunting game is always a popular one, and the kids will love it. After playing games, it’s a great time for an Easter movie before dinner time. The Blu-ray movies may have been prepared, and as a host, you will choose your favorites for the guests. If this is a normal 2D Blu-ray movie, and the guests have seen it before, they will feel the movies boring, after all, people don’t want to see the movies again and again. So as the host, you may want to think of a new way to attract the guests’ attention. How about creating 3D Easter Blu-ray movie from 2D Easter movie? The post introduces 2 ways for you to create 3D Easter Blu-ray movie: to burn Easter movie to 3D Blu-ray movie and to convert Easter Blu-ray to 3D movie. The first solution to create 3D Easter Blu-ray movie is to burn Easter movie to 3D Blu-ray movie, which can be aided by a professional Blu-ray burning program. Leawo Blu-ray Creator is such a program, offering you the best solution to convert Easter movies and burn to DVD/Blu-ray disc/folder/ISO image file with 3D effect added. 1. 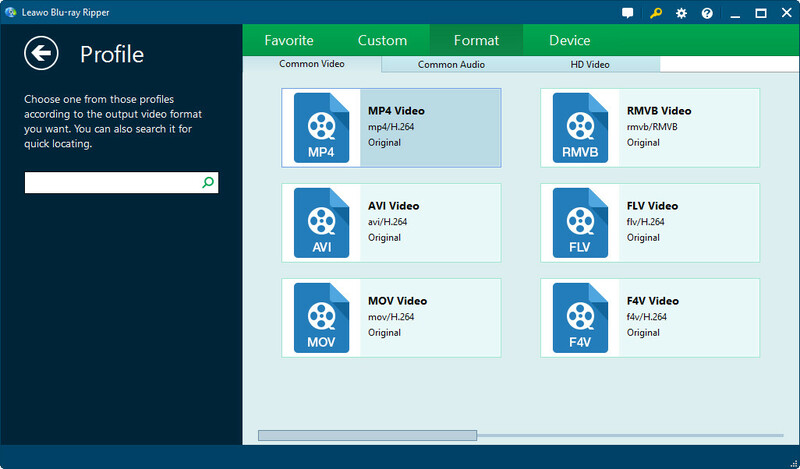 Burn any video (180+ formats like M4V, MP4, AVI, FLV, etc.) to Blu-ray/DVD disc, folder and/or ISO image file. 2. 6 different 3D effects available: Red/Cyan, Red/Green, Red/Blue, Blue/Yellow, Interleaved, Side by Side. 3D Depth is adjustable. 3. 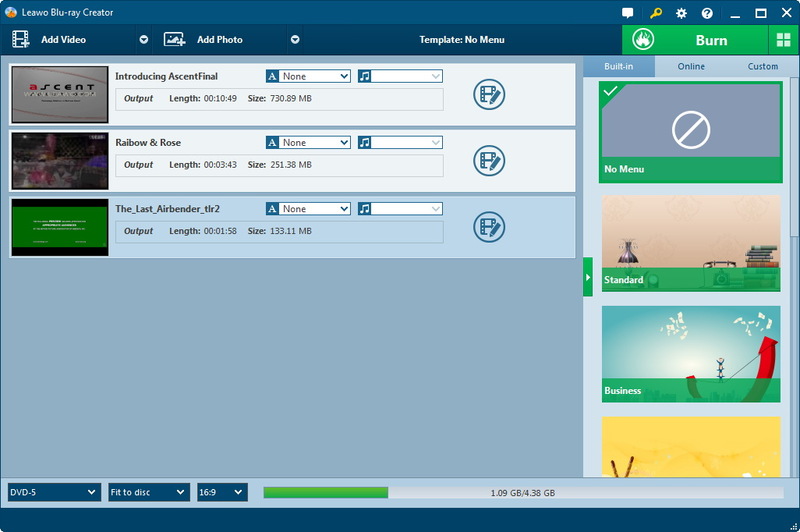 Add and edit disc menu by adding background music/image/video, changing title position, text color, font, etc. .
4. Edit source video files like adding signature, changing video effect, rotating videos, adding 3D effect, etc. How to Burn Easter Movie to 3D Blu-ray? Download Leawo Blu-ray Creator via the below links and then install it on your computer. Mac users could download the Mac version. Insert a blank writable Blu-ray disc into the Blu-ray recorder drive, open source Easter movie folder and launch Leawo Blu-ray Creator to get started. Click the "Add Video" button to browse and add Easter movies. You could add multiple Easter movies. Note: Set output disc type (BD50 or BD25, according to the Blu-ray disc you’ve inserted into the drive if you want to burn Easter movies to Blu-ray disc. If you only want to burn Easter movies to Blu-ray folder or ISO image file for saving on computer, select any one as you like), aspect ratio and frame rate at the bottom. Click the "Edit" icon in each loaded Easter movie, or right click a title and then select "Edit" option to enter the video editing panel. Open the "3D" panel, swith "3D mode" to green, and then select a 3D effect from the 6 listed ones. Adjust the 3D Depth. You could get instant preview via the built-in player. Click the "OK" button to return the main interface. 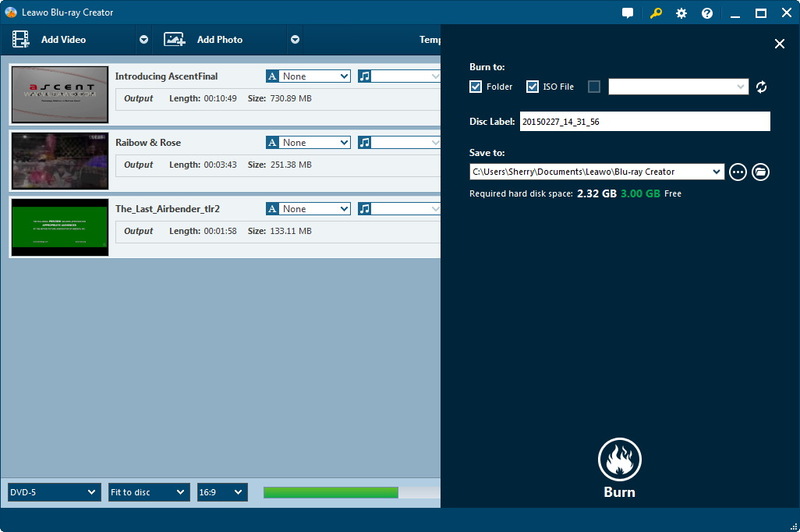 Note: Insert Blu-ray disc into Blu-ray recorder drive, set output Blu-ray disc type at the bottom of the main interface (mentioned in Step 1), and then choose Blu-ray recorder drive as target under "Burn to" option to burn Easter movies to Blu-ray disc. To burn Easter movies to Blu-ray folder or ISO iamge file, select Folder or ISO file under the "Burn to" option. "Burn to" option allows multiple choices. At last, click the bottom "Burn" button. This Blu-ray Creator would start to burn Easter movie to 3D Blu-ray movie immediately. You could view the burning progress on the Burning interface. After burning, you get 3D Blu-ray disc of Easter movies. The second solution to create 3D Easter Blu-ray movie is to convert Easter Blu-ray to 3D Movie. To convert a Blu-ray Easter movie to 3D movie, you will need a piece of Blu-ray converting software to accomplish the task. People can find various kinds of Blu-ray converting programs on the Internet, but I would like to introduce Leawo Blu-ray Ripper to you guys. The software is used for ripping and converting Blu-ray and DVD discs to videos, converting 2D movies to 3D, and tons of other powerful features to help users to get perfect using experience. How to Convert Easter Blu-ray Movie to 3D Movie? The following guidance will show you how to convert Easter Blu-ray movie to 3D, and you are allowed to free download the software to have a try. 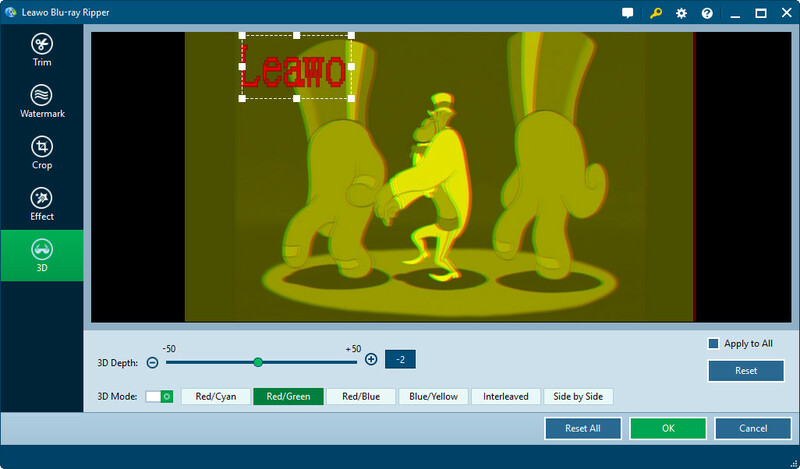 Run Leawo Blu-ray Ripper on your computer, and you will see the main interface. Click the “Add Blu-ray/DVD” button at the upper left corner to import the disc into the software window. Of course, you need to plug the Blu-ray disc into the computer at first. 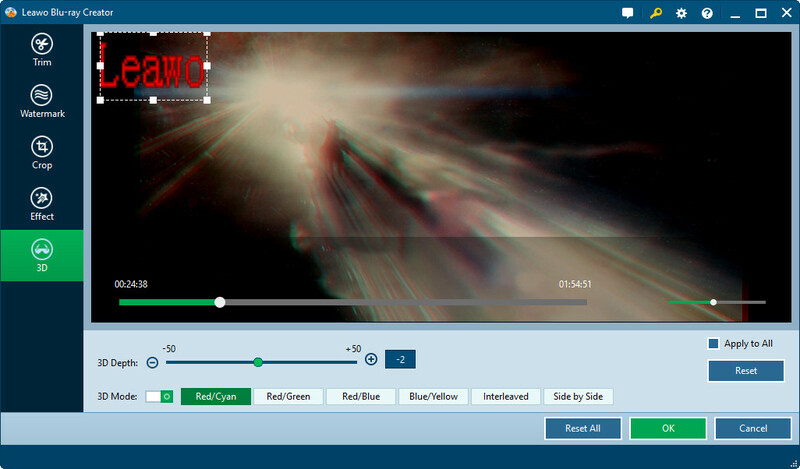 Click the MP4 button beside “Add Blu-ray/DVD” button, and then choose a video format as output. Then click the edit button (pencil on a movie clip), and you will see several features in the left sidebar. Choose “3D” at the bottom of the left sidebar, and the category will turn green. You can choose the 3D depth and mode in the right part of the window. Then you need to click “OK” to start converting the Easter movie to 3D. You will see the main interface of the software again. Click “Convert” button at the upper right corner, and then choose a folder on your computer to save the exported files. Then hit the “Convert” button at the middle bottom to start converting Easter Blu-ray movie to 3D. The progress bar will show you the percentage of the conversion. After creating 3D Easter Blu-ray movie, you can play it on your 3D players. It is sure that the 3D movie is more attractive than the common 2D movies. If you have a 3D movie for your Easter Sunday, it will be a surprise to your families and friends.